Granite islands in the kitchen and spacious lounges flow out onto ocean views. 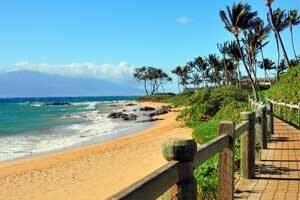 15 Min Drive to Maui Brewing Co.
You've got prime access to Wailea and Polo Beach. Wailea Golf Club is right up the road. Watch the sunset over the ocean with a Mai Tai in hand. Awarded a TripAdvisor Certificate of Excellence, Polo Beach Club, A Destination Residence is set on the south end of Wailea Beach – Maui’s top-rated beach – just steps from the shore. The resort is conveniently located on the less crowded side of Wailea Beach, away from the hustle and bustle but close enough to enjoy everything that the area has to offer. I hope you packed your sunblock because I have a feeling you won’t be spending very much time indoors. Work on your backstroke in the oceanfront pool, or lounge poolside and throw dive sticks for the kids. When it’s time for lunch, look no further than the bbq grills. Let the little ones help carry burgers, hot dogs, and buns. Don’t forget the ketchup! After lunch, have the kids grab their buckets and shovels and head for the beach. Air-conditioned one- to two-bedroom condos sleep two to six guests. Bring the family along to the local Safeway; your full kitchen won’t stock itself. Surprise the kids with Taco Night. Cook the meat and lay out a selection of tortillas, taco shells, cheese, and sour cream and let the kids assemble their own tacos, the messier, the better! Don’t worry; there’s an in-suite washer/dryer that will help with post-taco cleanup. While the laundry is going, catch a rerun of Friends on the cable TV. DVD players are perfect for family movie night. Pack favorite movies from home, call everyone into the living room and pop some popcorn. Upgrade to a two-bedroom prime condo for a better view from your private lanai, or to a two-bedroom deluxe condo for a recently renovated unit. The resort is just a short drive to Wailea Golf Club’s Blue Course. Rated among the best golf courses in the country by both Golf Magazine and Golf Digest, this eighteen-hole, Arthur Jack Snyder-designed course is known as Wailea’s original golf course. Visit the Pro Shop for resort and golf apparel, handbags, and accessories. Dine at Gannon’s Restaurant; it’s one of Open Table’s Top 100 Best Outdoor Dining Restaurants. Gannon’s serves contemporary Hawaiian regional cuisine with locally-sourced ingredients. The Shops at Wailea offers luxury and affordable shopping. Prada, Tiffany & Co., Bottega Veneta, and Louis Vuitton are the luxury brands available. More affordable brands include Honolua Surf Co., GAP, Billabong, and T-Shirt Factory. Grab a new pair of sunglasses at Sunglass Hut. Stop by Coffee Bean & Tea Leaf for a delicious Iced Blended and ask about coffee-free options for the kids. Restaurants include Cheeseburger Grille & Tap Room, Longhi’s, Tommy Bahama Restaurant & Bar, and Ruth’s Chris Steakhouse. - The front desk is open daily from 8:00 AM - 9:00 PM. The check-in location differs from the property location. To check in, go to 34 Wailea Gateway Place. If you arrive at the property after hours, you'll need to check in at an alternate location: 3800 Wailea Alanui Drive. If you are planning to arrive after 9:00 PM please contact the property in advance using the information on the booking confirmation. - Guests driving to the property should contact this property in advance to receive directions to the check-in location. On the day of check-in, follow these directions to the after-hours check-in location: from the Wailea Gateway Center, take Wailea Ike Drive to the stop light at the Shops at Wailea, turn left and take the second right to the security gate at Wailea Beach Villas. Here, you will receive room keys and directions to your resort. Please contact the office using the information on the reservation confirmation received after booking.